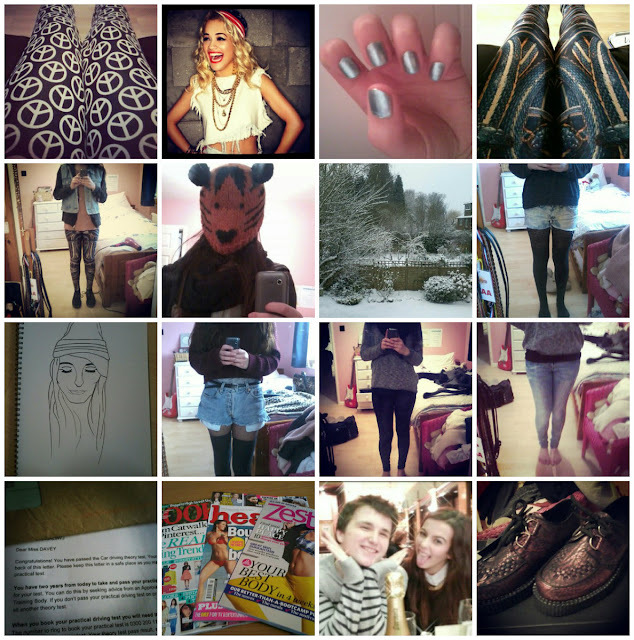 CND print leggings - Rita Ora is my girl crush (so is Cara) - blue nails for Jan - BM snake pit leggings - ootd feat. snake pit leggings - my cute tiger beanie hat - snow!! - ootd feat. diy bleach denim shorts with lace tights - drawing I did of Grace from Other Infinities - ootd feat. crop jumper and vintage levis - new velvet leggings from romwe - diy bleach jeans - passed my theory test for driving! - chilling with some glossies - the boyfriend and I pulling faces at Richoux on New Years - new creepers! Great pictures :) Love this post!